My question: Was Woodrow Wilson really a liberal? Wilson committed United States armed forces to WWI, the United States had been a country which avoided entangling itself in foreign wars prior to Wilson (Wars between rather than with foreign powers). Wilson action was thus treading new ground. a- doing so when the war was more than half over, public opinion in the US had turned against neutrality due to unrestrictive U-boat warfare, and the nation's banking system had heavily invested in France and Great Britain's war effort. instituted the Federal Income Tax. a. The federal government had adopted an income tax in the 1890s, but that tax had been struck down by the Supreme Court in the case of Pollock v. Farmers' Loan & Trust Co. before taking effect. Started the Federal Reserve Bank. a. Reincarnation of the Bank of the United States, the first national bank chartered by Congress which was discontinued after criticism from Liberals. He supported raising wages of railroad workers when they threatened a nationwide strike in 1916 as well as the 8 hour work day for certain vocations including rail road workers. Objected to the Treaty of Versailles as too harsh on Germany - but lobbied the Senate to ratify the treaty. Championed the League of Nations, the fore runner of the United Nations an organization the United States never joined. Wilson was an southern evangelical, typically not associated with liberalism. Wilson inherited a desegregated civil service and segregated it. Washington was a rigidly segregated town--except for federal government agencies. They had been integrated during the post-war Reconstruction period, enabling African Americans to obtain federal jobs and work side by side with whites in government agencies. Wilson promptly authorized members of his cabinet to reverse this long-standing policy of racial integration in the federal civil service. Wilson was personal friends with Thomas Dixon Jr., the author of the book Clansman, which the Movie Birth of a Nation was based upon. Wilson generally thought the Klan was a positive organization. This Quote from Woodrow Wilson appears in the film, which Wilson hosted a special screening of at the White House. Wilson won the presidency in 1912, with the conservative vote, the liberal Republican vote being split by Teddy Roosevelt and William Howard Taft. Wilson revised antitrust-laws ending what was a Teddy Roosevelt policy of "trust-busting". Wilson Ran for office in 1912 on a States Rights Platform in opposition to progressive candidate Teddy Roosevelt's policy. Tariff reform, - Wilson passed Tariff reform which lowered tariffs for the first time since the civil war. Women’s suffrage, - Luke warm support for woman suffrage for first 7 years of his presidency, until violent demonstrations at the Whitehouse prompted him to speak out. Woodrow Wilson and the Women's Suffrage Movement: A Reflection. In 1917, suffragist picketed outside of the White House demanding Wilson’s support extend beyond what they deemed as mere lip service for the cause. While at first largely peaceful, the protests later turned violent resulting in the detention of several women who then protested their incarceration with hunger strikes. Wilson was appalled when he discovered that many of these women were being force fed in the prison and finally stepped in toward the fight for women’s enfranchisement, finally joining his daughter, leading suffragist Jessie Woodrow Wilson Sayre. Prohibition of child labor, Wilson signed the Keating-Owen Child Labor Act(1916), went in effect Sept 1, 1817 his seventh year in office, and it was repealed by Supreme Court 9 months latter. As the comments go into, it depends on your definition of "Liberal". If you go with the common usage in modern US political parlance, which essentially means "embodies everything the Republican Party is against", then no he wasn't. Not even close. If you go with the sense of Classical Liberalism, then that was indeed fundamentally his outlook. The speech made by Wilson took many domestic progressive ideas and translated them into foreign policy (free trade, open agreements, democracy and self-determination). Note that first half of the description there is economic. Classical liberals were strongly against interference in the free market, by organized cartels, unions, or governments. In the US in the 1950's a lot of the remaining adherents to this political philosophy quit calling themselves "Liberals" and started self-identifiying as "Libertarians". The fit may not be perfect (for one thing, the issues today are completely different), but if you are more familiar with the modern US usage of political terms, it may be easier for you to think of Wilson as a Libertarian1. The traditional foil of the (Classical) Liberal outlook in that era was Reactionary2 which prior to WWI basically meant upholding a more traditional paternalistic political system, where power flows only from the top down, and few if any citizens have any real say in their government. This is the philosophy he was fighting in Europe, and which the war more-or-less dismantled. Of the 6 "major powers" in Europe involved in the start of that war in 1914, at the start of the war there were 4 authoritarian "Empire"s complete with inherent social classes, and at the end of the war there were 0 of them. The question's hits against Wilson's "Liberalism" are generally not talking about Classical Liberalism at all. Instead, this is covered under a very different political philosophy that Mencken and Nock believed FDR appropriated the term to cover, and which "classical" liberals did not approve of. This new system is often today called Social Liberalism. Social liberalism (also known as modern liberalism in the United States and left liberalism in Germany) is a political ideology and a variety of liberalism that endorses a regulated free market economy and the expansion of civil and political rights. A social liberal government is expected to address economic and social issues such as poverty, health care and education in a liberal state. Its certainly true that Wilson was not one of those. 1 - Understand that "Libertarian" only has this meaning today in American English. In most of the rest of the world, Libertarians are considered far left wing, and can encompass both Marxists and Anarchists. The meaning of political words is heavily-reliant on context. My question, which this OP refers to, uses the term "classical liberalism" and uses Hayek as a reference point to make sure that I'm not misunderstood. Classical liberalism doesn't mean at all what it sounds like to someone who is thinking in terms of the usage of "liberal" in today's United States. In its economic dimension, it means almost the opposite of that. Classical liberalism refers basically to laissez faire capitalism, i.e., the opposite of US "liberalism," if you're thinking in terms of a unidimensional political spectrum based on economic policy. Classical liberalism also has more than an economic dimension. It involves civil liberties and the rule of law, which is what distinguishes it from things like statism, fascism, and Chinese-style state capitalism. In economic terms, the political norms of the US in that era were indeed laissez faire capitalism with a small and weak federal government. Wilson fit solidly within those norms. But in terms of civil liberties and the rule of law, there is no possible way to shoehorn Wilson into classical liberalism. His presidency represented an abrupt regression in those areas. The Ku Klux Klan, which had been destroyed by the Republicans during early reconstruction, was rebuilt in 1915 as a terrorist organization, and as noted by the OP, Wilson heartily approved of the new Klan and publicly gushed over its propaganda. The federal government was resegregated under Wilson. 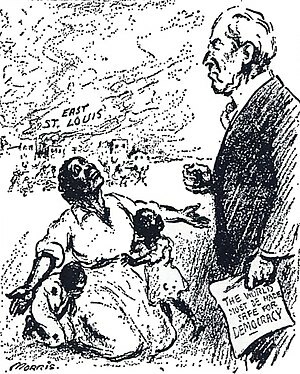 The East St. Louis Massacre happened on Wilson's watch, as dramatized by the cartoon below, with the caption "Mr. President, why not make America safe for democracy?" The first Red Scare and the Palmer raids were new phenomena in which civil liberties such as freedom of the press was attacked in an unprecedented way. So no, Wilson was not a liberal even in the sense of being a classical liberal. He represented a full-blown attack on the ideals of classical liberalism. Even by the standards of the time, his administration was a marked regression in civil liberties and the rule of law. Not the answer you're looking for? Browse other questions tagged united-states political-history world-war-one or ask your own question.